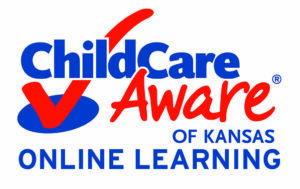 Child Care Aware of Kansas Online Learning programs have courses available for busy early childhood professionals. Courses are designed so child care professionals can complete annual training requirements for Licensure, complete the training requirement of the Child Development Associate (CDA) credential or training hours needed for the CDA credential renewal. We offer trainings using three different methods. 1.Child Care Aware of Kansas Online Learning offers a pre-service learning experience for all child care providers anytime, any place, at their pace. Learn more here. To register for courses click here. 2. Child Care Aware of Kansas Online Interactive option offers a virtual online live classroom opportunity. You can log in to a live classroom from anywhere, while still experiencing all the benefits of a traditional classroom setting. Watch your instructor present the material and participate in class discussions in real time. Learn more here. Check out our online calendar to find out when our next class is. Search “Online Training”. For your convenience, Child Care Aware of Kansas has a Professional Development Plan template to help as you advance your skills and education. It is available here.